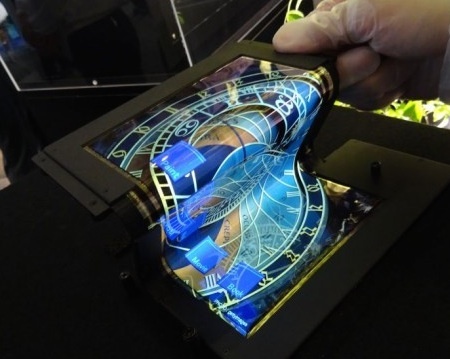 Check out this three-fold OLED touchscreen display from Semiconductor Energy Laboratory (SEL). It was introduced at the Display Innovation 2014 event in Japan last week. The OLED touchscreen SEL has developed is 8.7-inches and has a resolution of 1920 x 1080 (254ppi). As well as including all the benefits of OLED (very low power use, excellent colors, thinness), SEL managed to make the screen fold in three. As you can see from the images, that allows what looks like a typical 8.7-inch tablet to fold down to be a device that’s closer in size to a smartphone. The display itself weighs 6 grams and is clearly only a prototype for now, but it does give us a glimpse of one possible future for tablets and smartphones.